Furniture? A/V Equipment? Props? Specialty Graphics? Printed Carpet & Flooring? Yes, of course, we can do it all. We have enough furniture in-house to fill 40 to 50 exhibits at one time. Tables, chairs, high top tables, bar stools, lounge chairs, club chairs, sofas, and loveseats. Meeting room furnishings and serving bars. Reception counters in a variety of styles and colors. We have lighted counters and bars, and chandeliers to hang over meeting tables or sales counters. We have it all and if we do not have it in stock we will buy it for you to rent. A/V equipment is a key element to move your message onto the show floor. We have video walls and screens, and smaller screens within kiosks. We have or will get you any type of screen you want from touch screen to transparent. Additionally, we have many computers to rent and video kiosks. Flooring Sets the Tone of Your Exhibit Environment. Most USA companies opt for carpet and padding however, throughout the world raised flooring is considered the standard. We also print your carpet or vinyl flooring choice in house with any pattern you can dream of and your logo printed right along with it. You want stone or tile? Your vision is our reality. Specialty Graphics for your exhibit display are in our wheelhouse. We create 3D logos with interior lighting. We will move that same logo to stand on the floor and be one foot thick. You dream it and we make it. We have CNC machines, electricians, commercial flatbed printers and more. We print wallpaper to give your exhibit display a seamless appearance. Dye sub fabric printing is also in our cache of expertise. We build and print all our hanging sign structures as well as walls. We can provide it all. Our installation and dismantle team is provided by Absolute I&D. Their laborers are not third party contractors, they are employees. Using in-house labor decreases costs while increasing program stability which improves on-site results. We never compromise on the show floor. The time for building issues passed many weeks ago. While it is no small undertaking to stand up complicated, technology-laden exhibits the show floor is not the place to uncover problems. We have got you covered. We promise to deliver our best at every show and every location. With our Upfront Fixed Price Guarantee we ensure everything you need is on-site, on time and within budget. 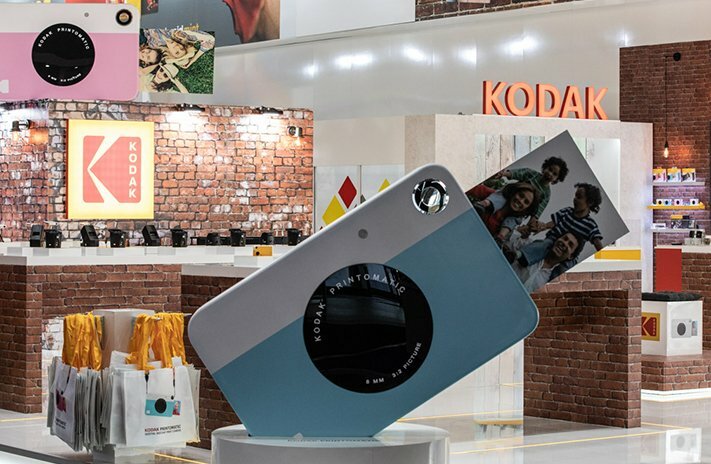 We made a functioning (well it did not actually take a real picture) giant camera that shot out a photo for both Polaroid and Kodak. We just dressed the 20 foot tall Buddha in a Golden Knights hockey jersey at Tao Restaurant and Nightclub in Las Vegas. We have made items for clients like Sega, Pokeman, and Corona Beer. We have just purchased a 19 foot tall windmill for a PMA client. 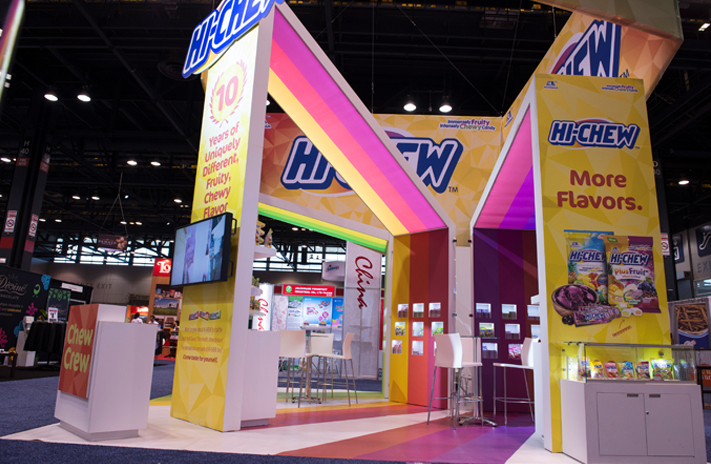 We understand the WOW factor your exhibit display requires. Don’t just take our word for it; view us in action on the trade show floor. 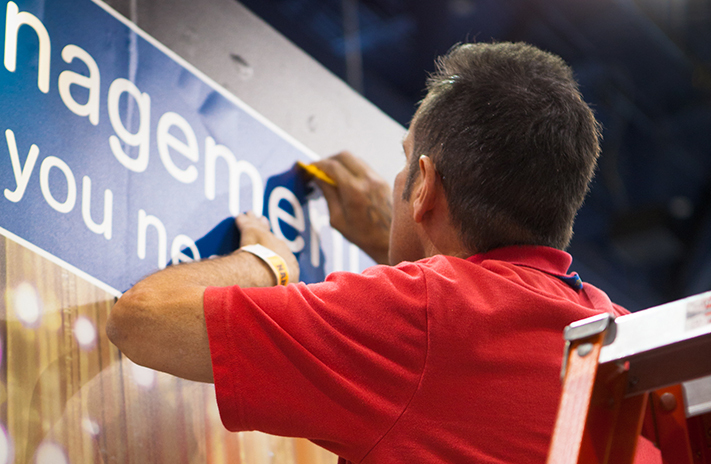 When you have 30 trade show displays at a trade show, it really does take a village to ensure everything is produced, installed, dressed and ready for show attendees. With Absolute I&D by our side, we can ensure every last detail is taken care of to your satisfaction.